It’s only a matter of time before the Diagnostic Statistical Manual, the bible for psychiatrists, includes data-driven madness. But before that, the purveyors of the knowledge economy will make a whole lot of money with cookies and apps data-mining and warehousing us toward compulsive consumption. Conspicuous? Hardly! That’s the secret of those who hold the keys to the knowledge economy. And that’s why I heartily endorse a recent Oregonian editorial advocating for a privacy bill of rights! Is education a commodity no different than the diapers and car seats we buy? Or would parents consider their kids’ education records sacrosanct? An EPIC question! On February 29th, the Electronic Privacy Information Center (EPIC) sued the U.S. Department of Education (USDOE) to block changes to education privacy rules. They believe the USDOE overstepped its legal bounds in allowing non-governmental access to students’ records without parents’ written consent. 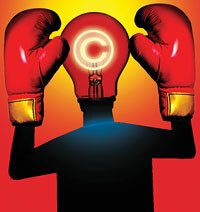 The Family Educational Rights and Privacy Act, (a law passed by Congress) is at stake. Senator Wyden’s “Student Right to Know Before You Go Act” relies on weakened privacy rules. This bill, Senator Wyden assures us, could generate ‘Carfax-style’ reports to help parents and students comparison shop for college. After all, college debts are consuming our kids’ futures to the tune of $1 trillion. $1,000,000,000,000. 1 x 1012 for math geeks. Can’t wrap your head around that one? Rest assured, bubble economies don’t grow out of thin air. The “job creators” handsomely rewarded financial engineers and bankers with their MIT and Harvard degrees for turning our economy upside down. Indeed, the “job creators” don’t care about your spiraling college debts or whether that noose around your neck comes from the U. of O. or University of Phoenix! These same “job creators” also reward politicians who write laws for the American Legislative Exchange Council. ALEC is the golden goose for corporate executives who meet with state legislators to write “model legislation”. Most Oregon legislators don’t know that Oregon already has a cradle-though-career database that will be up and running by June 30, 2012. Project ALDER (Advancing Longitudinal Data for Education Reform) is a “key deliverable” for the Oregon Education Investment Board to calculate a return on education investment. Project ALDER is compliments of Secretary of Education Arne Duncan, who was given broad discretion to distribute $5.5 billion through the American Recovery and Reinvestment Act of 2009. EcoNorthwest and the Chalkboard Project gushed about the opportunity to use stimulus to drive change and accelerate education reforms. Michael Winrip of the New York Times writes, “Experts in tax law say that Pearson appears to be using its foundation to push its business interests, which would be a violation of the federal tax code.” It’s hardly reassuring that Susan Castillo, Superintendent of the Oregon Department of Education, took a Pearson Foundation-sponsored trip to Brazil last September. This junket came as her influence wanes and Governor Kitzhaber wields temporary control over the appointed Oregon Education Investment Board. "When it comes to K through 12 education, we see a $500 billion sector in the U.S. alone that is waiting desperately to be transformed by big breakthroughs that extend the reach of great teaching," said News Corporation Chairman and CEO, Rupert Murdoch. "The leaders in this project were more than just leaders; they were truly ‘enablers.’"
"Turn your vendors into partners. Give them buy-in to the project and make sure that they know you value their opinion." "Buy the best product(s) you can afford for your project and plan for future expansions." The Project ALDER Data Collection Committee lists Pearson as an “agency” and Pearson employee, Rose Craighead, as State Reporting Business Analyst. Key recommendations for the ALDER’s Data Warehouse include Microsoft Windows as the operating system platform and Microsoft SQL Server as the database platform for the data warehouse. Since the Oregon Department of Education’s records retention schedule expires May 2012, it’s hard to know how long Microsoft, Pearson, other vendors and authorized representatives can expand their digital footprints on our kids’ education and wage records. Perhaps life-long learning will come with an unjustifiable sentence: indefinite warehousing of students as “human capital” data points. To open the Gates of knowledge, we need to connect the dots. Unfortunately, crony capitalism is a tough lesson to learn and even harder to correct. Our parents are our first teachers. They teach us some of life's most important lessons. My dad has taught me many lessons over the years. He is a hard working union carpenter. I remember the day he taught me about solidarity. It was the mid 90s, my awkward teen years were approaching and Fred Meyer employees were on strike. Sometimes it's those real life field trips that create a learning experience to be remembered. My younger brother and I went with my dad to stand on the picket line with Fred Meyer employees. The same people I saw bag our groceries and work in our local store were now on the street with signs. I wonder why my dad had dragged me to their picket that day. I realized over the years the lesson learned. We stand together when workers deserve better that is solidarity. After my dad finished reading the recent article Adam Sanchez and I wrote (below) he said he would be going to the picket line, "... just like the time we stood on the Fred Meyer picket together." As Gresham Barlow moves ahead with their plan for school as usual, I guess if you consider daycare and $250 subs usual, many parents are supportive of the teachers. Brianna Bigham wrote a plea to Gresham-Barlow parents in a letter to the Oregonian. "These teachers are with our children so much. They KNOW what happens in classrooms and how things like disruptive students, less prep time and other issues being argued over will affect our students. Especially now- when they have proven that those really ARE the most important issues- it's time for us to listen to their concerns and demand that the school district do the same. Maybe you will read the contract and still not feel comfortable standing on the picket lines with the teachers. But please, PLEASE, take the time to read it. When you get the district's letters, ask yourself: what is the other side? Because I promise, there is one. I'm a small voice. But hopefully, for the sake of my children and their education, I can be a voice of support and kindness for the teachers who are hearing so much negativity lately. I support my children by supporting the teachers who work for them every day." Teach your child a lesson this April. Support students by defending teachers. 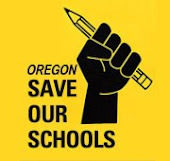 AFTER MONTHS at the negotiating table with intransigent school boards, some 750 teachers from the Gresham-Barlow Education Association and Parkrose Faculty Association voted April 11 by overwhelming majorities to authorize their respective bargaining teams to call for a strike. The executive council of the Reynolds Education Association, a third teachers union in Oregon's East Multnomah County that is also facing attacks, voted to declare an impasse the same day. This opens the possibility that another 600 teachers could be on strike in the coming weeks. Why are these teachers willing to strike? Those pushing for cuts to education want you to believe that greedy teachers are simply trying to take money from other workers. As Gresham-Barlow school board member Dan Chriestenson recently posted on the Multnomah County Republicans' Facebook page, "I view a vote to strike as profoundly offensive and disrespectful to the hardworking families who continue to pay the bills for the district in this down economy." In Chriestenson's world, the contract he and his fellow school board members unilaterally imposed on teachers--one that includes erosion in teachers' job security, reductions in preparation time and five furlough days and allows for the use of counselors as substitutes--is not "profoundly offensive and disrespectful" to the working families whose children's education will suffer as a result. The real issue for him is the fact that teachers are preparing to fight these attacks. What Chriestenson conveniently leaves out is the fact that teachers' working conditions are students' learning conditions. With endless budget cuts, students have fewer resources in the classroom and less support from education assistants and counselors. Increases in class sizes leave every child behind. Many students no longer have the joy of music classes, instruction in physical education or access to the library--all of which have proven to be supportive of student learning. Further, the loss of prep time hinders educators' ability to provide the differentiated and creative instruction required to meet various student needs. It also takes away from time educators can connect with families, collaborate with peers and attend meetings on students' behalf. In addition, the loss of protective language for educators will create an environment of fear in our schools, silencing the educator's voice for student advocacy and academic freedom. A student in an overcrowded classroom can get lost. A student with a teacher who doesn't have adequate prep time will receive less tailored instruction and less feedback on assignments. A student with a teacher who has no time to contact parents will not have a crucial bridge between school and home. These are some of the reasons why students with nonunion teachers do not perform as well as students with union teachers. BUT BUDGET-slashers like Chriestenson are hoping working families will overlook these facts and side with school boards against the teachers' unions. This outlook echoes the national attack on public sector unions. Rather than point the finger at the bankers, corporate executives or politicians who paved the way for the economic crisis, and the state budget shortfalls that have accompanied it, conservatives like Chriestenson want you to believe that it is greedy public-sector workers who are to blame. This argument is part of an effort to divide private-sector workers from public-sector workers in order to lower all workers' standard of living. The U.S. elite has its sights set on competition with the world's rising economies of China, India and the rest of Asia. That means drastically lowering the pay of workers here to compete with China's low-wage working class. In order to accomplish this, America's rulers need to crush any organized force within the U.S. working class. Breaking the teachers' unions, the largest single sector of unionized workers in the country, is a key part of that strategy. There is another more insidious consequence of the attack on teaching. Every time you undermine the job security, working conditions and wages of one group of workers, it makes it easier for employers to undermine them for all workers. This is why, during the Depression, many unemployed people organized in support of workers on strike, even though anybody with a job in that era was relatively privileged. They believed in the concept of solidarity--the idea that working people could only progress if they did so together, and if one group of workers improved their conditions, it would ultimately improve conditions for all. The attack on teachers and other workers is intertwined with the assault on public education. While the government has lent, committed or guaranteed $13 trillion to the banks, and spent trillions on wars overseas, the stimulus package only included about $140 billion in aid to the states, roughly the same size as Wall Street paid out in bonuses in 2009. As cash-strapped states look to the federal government for help, all they see is the $4.3 billion Race to the Top funds. President Barack Obama and Education Secretary Arne Duncan made states compete for these grants by using eligibility requirements that further the agenda of testing and privatization through the creation of charter schools. And because state governments typically cut taxes on corporations and the wealthy and put the majority of the tax burden on the middle and working classes during the neoliberal boom, most states are now finding huge holes in their budgets as unemployment and foreclosures rise. The attack on workers and education is a bipartisan effort. By picking Duncan to run the Department of Education, Obama made it clear that his administration was no advocate for public education. More than 300,000 educator jobs have been lost since 2008. If teachers and other workers hope to defend public education and a decent standard of living for the U.S. working class, we will need to use our most powerful weapon--the strike. For too long, we have we sat by while "shared sacrifice" has meant the rich get richer while we suffer. If there is any hope for the children in our communities--and if we want them to have a future that isn't confined to poverty, unemployment, debt and despair--we need to teach them the real power that working people have to defend ourselves. We need to teach them there is power in solidarity--that when we fight injustice, others will rally to help. This is why students, parents, and working people from all over Oregon should be prepared to head to the picket lines starting April 25. Support our schools, defend our teachers!